Editor’s note: Much has changed at Augusta National in the decade since then-chairman Hootie Johnson, responding to increased pressure to admit female members, famously said, “There may well come a day when women are invited to join our membership, but that timetable will be ours and not at the point of a bayonet.” Condoleezza Rice and Darla Moore became the first women members in 2012 and more have joined since, but the club’s boldest acknowledgment of the need to evolve was the formation of the Augusta National Women’s Amateur, an annual event debuting this April that will conclude on the Saturday before the Masters. Most golf fans have never seen a woman swing a club on Bobby Jones and Alister MacKenzie’s masterpiece — that’s about to change. The story of this breakthrough event isn’t only about Augusta National unlocking its gates, it’s also about the talented women marching through them. In this series, we’ll introduce you to five of them. Next on the tee: Alexa Pano. Rick Pano has a flat tire. It’s 77 degrees in Bradenton, Fla., and his 2018 Chevy Tahoe is disabled on the side of an exit ramp. His 14-year-old daughter Alexa is doing homework in the front seat. The situation is less than ideal, but it beats the trio of tornadoes they dodged leaving Myrtle Beach the night before, fresh off Alexa’s 12-stroke victory — yes, 12 strokes — at the Dustin Johnson World Junior Championship. Rick calls it the drive from hell. He drove until 2:30 a.m. before pulling off at a rest stop near Davenport to grab a few hours of sleep. He hit the road again at 6 a.m., only to hit a snarl of traffic in Tampa. They’re on their way to Charlotte Harbor National GC in North Port, Fla., home of the Symetra Tour’s SKYiGOLF Championship. Alexa received a sponsor’s exemption and will be making her second Symetra start. Five days from now she’ll hold a share of the 54-hole lead, outplaying professionals twice her age, but for now, on this March morning, she and her dad are stalled on the shoulder, cars whizzing by as they wait for AAA to patch up the back-right tire. Such is life on the road for Rick and Alexa Pano, women’s amateur golf’s leading father-daughter duo. If Alexa Pano’s name sounds familiar, you may have seen her featured in the 2013 documentary The Short Game, which chronicles the 2012 U.S. Kids Golf World Championships in Pinehurst, N.C. The family-friendly flick offers an inside look at the game’s best 7- and 8-year-olds and their relentless commitment to excellence. Alexa, who was 7 at the time, is one of eight golfers featured in the film. She’s introduced less than three minutes in, blasting out of a greenside bunker with form that would make Phil Mickelson blush. She’s wearing a white skirt and red shirt with shoes to match, and her hair is pulled back with a New England Patriots visor. She’s asked about her career goals. “I want to be the first woman to play a tournament at Augusta,” she says. At the time, her answer sounded like a fantasy, but now, seven years later? Alexa is on the cusp of realizing that dream. The invitation didn’t seem real, she says, until the formal letter arrived at her house, even if she had to wait to open it (she had agreed to allow Golf Channel to film the big moment). Rick knew his daughter’s talent was special when she was 5. She grew up on Sherbrooke Golf & Country Club in Lake Worth, Fla., and still live in the city today. Hall-of-Fame teacher Bob Toski, who had taught Rick, helped Alexa learn the game, although he was more like a second grandfather than an instructor. Working on her game is easy; Alexa doesn’t like off-days. Rick, a single parent, says some people think he’s strict; he says he treats Alexa like an adult. “I have rules like every other parent does, rules in golf and rules in life, and they are pretty basic and are no different than any other family,” he says. “But I think she’s got a pretty long leash — except when it comes to guys. There is no leash there.” Rick jokes — half-jokes? — that she has another 20 years before she can date. Pano will be the youngest player at the Augusta National Women's Am, but she's already participated in the Drive, Chip & Putt National Finals at Augusta National three times. She has qualified for three U.S. Women’s Amateurs, two U.S. 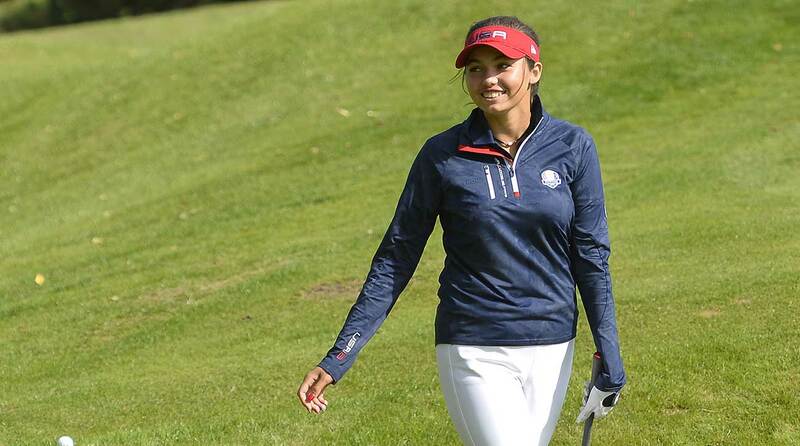 Junior Amateurs and was the first alternate in last year’s U.S. Women’s Open. Her victory at the Dustin Johnson World Junior was national/international title No. 67, and she’s also won eight U.S. Kids Golf World Championships. Alexa even has a charitable interest, the Veterans Golf Association, and will host her own event with the VGA in May. Lexi Thompson comparisons are common. Alexa played in her first pro event at 11 and has received three sponsor’s exemptions into LPGA and Symetra Tour events, but it was her victory at the Dixie Amateur in December that vaulted her amateur ranking (currently 66th) and solidified her spot in the ANWA. I think she could potentially be huge for the LPGA Tour being an American girl that could dominate the game. Her signature moments keep coming. At the SKYiGOLF Championship she was two back after the first round, three back at the midway point and in a four-way tie for the lead after 54 holes. The crowds were unusually big for a Symetra Tour event, buoyed by Alexa’s presence and strong play. She had so many people following her that they even had to send extra volunteers in carts to prevent people from getting too close and walking down fairways. “Please, get back, behind the ropes,” one woman said. The three pros she was tied with were a combined 41 years older than her. Playing in the final pairing on Sunday Alexa fired a one-over 73 and tied for 8th, five shots out of a playoff. She was aiming to become the Symetra Tour’s first sponsor’s invite to win since Brooke Henderson in 2015, and the youngest Symetra champ since Hannah O’Sullivan (16) in 2015. Alexa is among the few ANWA competitors who have actually been to Augusta. She’s qualified for the Drive, Chip and Putt National Finals three times, winning twice. Peter Jacobsen, a seven-time winner on the PGA Tour, has called the event for NBC since its inaugural year in 2014. That’s where he met Rick and Alexa. He was immediately impressed. Pano was the talk of the tournament in her second Symetra tour start of her career. The trio’s relationship has grown. They’ve played a couple of rounds together at Jacobsen’s home club in Naples (Jacobsen says he should get strokes from her), and Rick has picked Jacobsen’s brain about life on the road — where to stay, what to eat and how to manage free time. He reached out to Jacobsen again last year and asked if he had recommendations for a teacher for Alexa. He hooked them up with O’Connell. “When I met her, she looked like she could be 20,” O’Connell says. “Her golf ability was certainly nothing resembling a 14-year-old.” He was especially impressed by her bunker game, wedge play and consistency. “She does several things that would put her at the top of the LPGA Tour in those categories,” he said. O’Connell remembers their first range session well. Alexa was striping it, her swing was sound, and they got along just fine. But he was struggling to decipher her interest level, because she wasn’t overly talkative. Rick pulled O’Connell aside afterward and said things were actually going swimmingly: He’d never seen her that engaged in a lesson before. 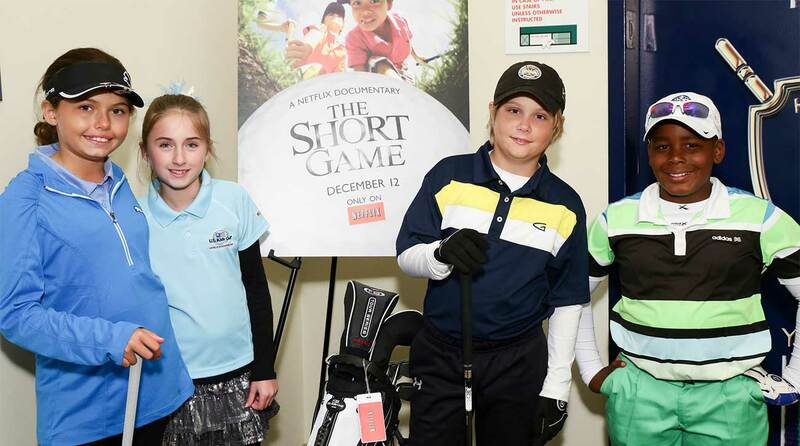 Alexa Pano (left) poses for a photo during a promotional event for The Short Game in December 2013 at Chelsea Piers in New York City. Some young phenoms make the mistake of trying to get better too fast. O’Connell is working with Alexa to keep her on a steady path of improvement. Despite all of her accolades, trophies and Instagram followers (13,000 and counting), Alexa is still a normal 14-year-old. She likes sketching and art and the mall and Stranger Things and Billie Eilish. Her Short Game fame still lingers, too, even if Alexa is embarrassed by some of it. Rick estimates he’s received more than 500 letters since the film came out. Some still trickle in from girls and parents who say it inspired them. Rick will caddie for Alexa at the ANWA. That’s not unusual. He often does. In one memorable scene from The Short Game Rick turns to Alexa as they walk off a tee during the opening round of the three-day competition. He puts his right hand on her right shoulder and leans in. “Do I really need a pep talk?” Alexa says.